The login node still needs to be able to access the FireWorks database. If you’re not sure, try to run a database query from the login node. The login node needs to be able to write files that can be read by the compute nodes, and vice-versa. Offline mode can only be used with the reservation mode of the queue launcher, since the login node must checkout and serialize a job in advance of the queue submission starting to run. 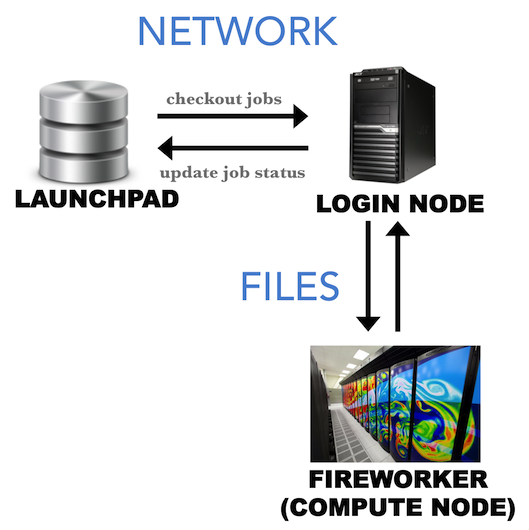 Using FireWorks in offline mode requires more human maintenance than normal mode, and generates extra files for communication within each job. Thus, trying to get a network connection up and running between your FireWorker and LaunchPad should always be your first line of attack. use a proxy service to forward connections from the MongoDB –> login node –> compute node (you might try, for example, `this tool <https://github.com/bakks/mongo-proxy`_). In offline mode, the login node will checkout a job, serialize it to a FW.json file, and put that file in the launch directory. When the compute node starts running the job, it will read the FW.json file to instantiate the Firework and run it using the --offline option of the rlaunch command. First, configure you queue file my_qadapter.yaml according to the instructions in the simple queue tutorial. However, in the rocket_launch section of the file, add the --offline tag to the end. For example, your rocket_launch section of the file might look like: rlaunch -w path/to/myfworker.yaml -l path/to/my_launchpad.yaml singleshot --offline. When finished, you can add FireWorks to your database. When you are ready to submit the jobs to the queue, make sure you use the reservation mode of queue launcher (-r option). For example, qlaunch -r rapidfire. More details on reservation mode can be found here. With those two small modifications, your job should get submitted and run successfully. You’ll notice that a FW.json as well as a FW_offline.json file got written to your submission’s launch directory. Next, we allow the compute node to communicate back job information to the LaunchPad via the login node. Since the compute nodes have no way to communicate job status via a network, they write files (FW_ping.json and FW_action.json) in order to report this information. The login node can periodically read these files and subsequently pass the information back to the LaunchPad. Type lpad recover_offline -h to see further options. If you move the files around before the lpad command can recover them, FireWorks may never know that your job finished. FireWorks looks in the directory the job was submitted in for these files. If job B depends on job A, job B will never run until Firework A has been recovered and reported completed. So, you should run lpad recover_offline frequently. This prints a help file stating how can “forget” certain FireWorks so we no longer try to recover them. The state of these FireWorks in the database will be frozen unless you run a command like defuse_fws or rerun_fws to handle them. While offline mode is typically undesirable compared to normal FireWorks operation, one advantage is that it minimizes the need for database access. Whereas normal operation requires the database to be fully operational while jobs are running, offline operation only requires database access when checking out and submitting jobs (qlaunch) and when recovering jobs (recover_offline). The database can be down for maintenance in between, while jobs are running.